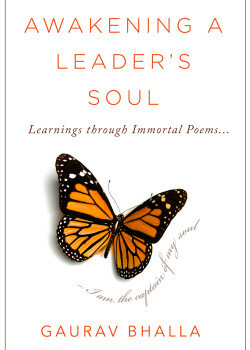 Awakening A Leader’s Soul: Learnings Through Immortal Poems by Gaurav Bhalla, Ph.D. is unique business leadership book that bypasses the usual offerings of practical business advice and decision-making skills in favor of centering on the leader’s humanity and, by extension, taking readers on a fascinating journey of self-discovery and deeper awareness. Author Gaurav Bhalla, Ph.D., whose novel The Curse and the Cup was reviewed here previously, achieves a remarkable level of thought-provoking originality with Awakening A Leader’s Soul, which mines the inner world of readers with a guided exploration of one’s true self—not a common subject in management seminars curricula. For anyone reading today’s news headlines, the author’s audacious leap of unconventional spirit in this book could not be more timely. Take this aptly said paragraph, for example: “The book began with the Prologue extending a simple invitation to readers to explore the world of Soulful Leadership with the help of a different set of teachers, the sagely world of immortal poems. The motivation for extending that invitation stems from an unshakable conviction that the worldviews and behaviors of many of today’s leaders are inadequate to meet what’s required for the wellbeing and prosperity of the disparate and conflicting constituencies of today’s complex world.” How true!